Gaël Le Roux has a Master’s in the law of the European Union from Aix-Marseille University (2011) and a Master’s in international relations form the Bruges College of Europe (Marie-Sklodowska-Curie cohor, 2012). From 2013 to 2015, Gaël Le Roux has been the head of mission in the delegation of the Mouvement des entreprises de France to the European Union. 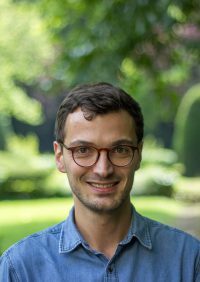 Since 2015 he has been doing his PhD under the joint supervision of the ULB, where he is a researcher, and Aix-Marseille University, where he has a PhD contract. His research work is supervised by Professor Marianne Dony (CDE-ULB) and Professor Rostane Mehdi (CERIC-AMU). He is dedicating his thesis to the study of the digital dimension of bilateral trade agreements negotiated by the European Union with third countries. His approach is focussing more particularly on the regulation of trade in IT services, access to telecoms services and networks, the regulatory framework for electronic commerce and the regulation of on line author’s rights. His interest relates more generally to the law on external relations and the common trade policy of the European Union. He is also interested in European regulation developments in the digital economy, in particular concerning data protection, net neutrality and the responsibility of online intermediaries. Tel. : +32 (0)2 650 30 27.